Most of us are familiar with outdoor misting, and have felt the relief a good misting system can bring when warmer temperatures arrive. But what about animals or livestock? Horses, cows, and chickens are just a few of the animals that have a very low tolerance for heat stress, and are at risk of health problems if left in adverse conditions. Fortunately, the concept of misting has made its way to the barnyard as well. Horse owners, farmers, and the like are depending more and more upon animal cooling misting systems to provide their animals with much needed relief. Different than a typical misting fan, animal cooling systems use flash evaporative cooling to bring down temperatures far more effectively than regular fans ever could. Using atomized water droplets, they “flash cool” the hot air found in a barn or stall instead of simply moving the air around. A built-in filtration system and water conditioning module helps the system resist the build-up of scale and lime deposits. 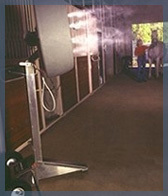 Best of all, advanced misting systems such as these are easy to use. A standard garden hose water connection makes for an easy hook up, while oversized wheels make transport over rough terrain an easy to achieve task. Horses are among the animals most at risk during summer, when high temperatures and humidity combine to make body heat accumulate faster than your horse can get rid of it. But they are not alone in being at risk. Cows are vulnerable to heat stroke or even death due to high temperatures, which can also adversely effect milk production as well as the egg output of chickens by 20-40% during the summer months. Livestock cooling systems can eliminate these issues by reducing temperatures by as much as 20 degrees or more. Keeping your horses or livestock cool during the summer is more than just an act of kindness. It’s a matter of safety. Animal cooling misting systems act as the first line of relief when temperatures rise, and make conditions comfortable and livable for the animals we love and depend on. Summer will be here before you know it. Make sure the coolness and comfort you provide for yourself and your family extends outdoors to the horses and livestock that can truly use it on a summer day.